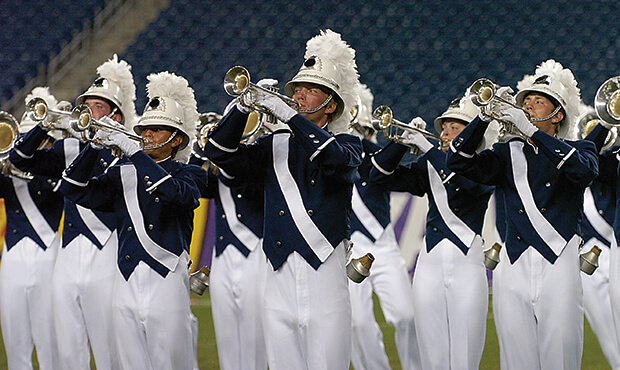 On a day when the sweltering heat at Foxboro, Massachusetts' Gillette Stadium broke a 101-year-old temperature record for the Boston and Providence suburb, the score for the Cadets at the 2005 DCI World Championship Finals was just as hot, tying the Cavaliers' then-record high score of 99.150. Drum Corps International had last visited the site in 1994, when the former Foxboro Stadium played host to an activity that hadn't yet witnessed any-key brass instruments, amplification, and a separate scoring caption for color guard. Bluecoats' fifth-place show, "Caravan," brought the corps its highest placement up to that point in history. When announcing the concept of the program to the drum corps public in the off-season, the Ohio-based organization posted: "Drum corps is not about the destination … it's about the journey." In this case, the journey was inspired by the caravans of early traders traversing the deserts of North Africa, traveling together in large groups for safety. The show captured exotic sounds of oases, mirages, and cities of danger and intrigue. The journey began with exotic drums introducing the famous jazz standard, "Caravan," written by Juan Tizol, trombonist for the Duke Ellington Orchestra. Barney Bigard and His Jazzopators originally recorded the piece in 1936 with Ellington playing piano on the session. Ellington popularized the song by playing it continuously throughout his career, and it's said more than 350 recordings were produced of the tune by his orchestra. While the opening segment of the jazz standard was fairly brief, the melody of "Caravan" served as the musical thread that wove together two tunes written for Cirque du Soleil, the performing company that took its name from the French term for "Circus of the Sun." Benoit Jutras wrote "Incantation" for Cirque du Soleil's "Quidam," a touring production that premiered in 1996 as the company's ninth stage show. Jutras was the entertainment company's first music director, though not its first composer. The show was based on the story of a bored girl who in her mind creates an imaginary world. To bring the piece to life, the Bluecoats utilized flags of muted desert colors to help convey the mystical nature of the open expanse of desert encountered during the caravan's travels. One particularly notable drill formation in the visual program was when corps members in front of a large triangle block sequentially turned and passed through what remained of the inverting form, with the point of the triangle coming out the other side. The second Cirque du Soleil tune utilized by the Bluecoats, "Ombra," was from the 2000 touring show, "Dralion," which combined the Chinese acrobatic circus tradition with Cirque's unique take on pageantry. A muted trumpet feature opened the ballad, and later, the snare drummers played a feature on shell-less drums that resembled tuned drumheads. Along the way, muted bass drums accented North African drums that heightened the exotic flavor. Visually, the entire horn line ended "Ombra" in one large flattened squiggle, stretching from the lower left corner of the field to the upper right corner. The journey of the caravan culminated with Stephen Melillo's "Hajj." According to the composer, the piece was "offered as a tribute to the faithful who each year make the Hajj, a pilgrimage to Mecca ... and to all those who make each day a new step in life's journey. 'Hajj' is about the moment before the real prayer begins. It is fraught with intrigue and sidetracked adventure, moments of introspection and exuberant dance!" The front ensemble introduced drumspeak to the work, a form of verbally expressing rudiments and other complex rhythmic patterns. In the beginning, just one performer presented the verbal gymnastics, but later, multiple performers joined in, passing the drumspeak around the pit. Flags as flaming hot as the desert sands filled the field as the show concluded with pulsating, stabbing chords from the brass section that could fry an egg on the scorched turf of the stadium. For this week only, you can save on the World Championship DVD set that contains this complete Bluecoats performance, along with all finalists from the 2005 DCI World Championships. Buy the 2005 World Championship DVD set. (Available this week only for 20% off. Regular price: $39.95.) Discount DVD offer ends Monday, Dec. 22, 2014.